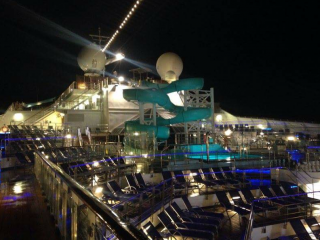 A man has gone overboard on a Carnival Victory cruise headed to Cozumel, a Rockland County resident aboard the ship told the Rockland County Times. The Rockland resident said the ship’s PA system announced “man overboard” around 3 a.m. on Wednesday, March 22. The ship made a 180 degree turn and a life jacket was thrown in the vicinity of where the man was thought to be. The life jacket was found floating several hours later. The witness said the ship has been somber and quiet since the announcement. After several hours the ship’s crew fears the worst. The cruise ship departed Miami, FL on March 20 and set out to Key West and Cozumel. UPDATE– Our eyewitness says Carnival has cancelled the scheduled trip to Cozumel.